Aspire, Inc. is a non-profit agency that provides an array of services to people with intellectual/developmental disabilities . Our Vision is For all people to be valued members of the community. Our Mission is to create opportunities for people with disabilities to enhance their community. We are committed to promoting a community where all people are accepted and valued. The first facility to aid and train adults with developmental disabilities in the Aberdeen area was formed in December, 1960. The physical facility was donated by the city of Aberdeen and was located at the corner of 12th Avenue and Washington Street near the Northern State University campus. The name of the facility was the Aberdeen Sheltered Workshop. It was modeled after the Sheltered Workshop already in operation in Sioux Falls, South Dakota. At that time, South Dakota had only two such facilities, the other one was located in Rapid City. Aberdeen’s workshop was funded originally through the Association for Retarded Citizens(ARC). In 1965, the name of the workshop was changed to the Adjustment Training Center, Inc. The first contract received by the Aberdeen Sheltered Workshop was from the Pepsi Cola Bottling Company in Aberdeen. The Pepsi Company furnished pop cases that were in need of repair. A year after the Aberdeen Sheltered Workshop began, other projects became available. Besides the Pepsi contract, the workshop procured contracts from Coca-Cola, KO Lee, Safeguard, Dakota Sash and Door, Jewett Drug, Kesslers and a plastics factory in Mobridge. Other projects included services to the community, such as: laundry for beauty shops in the area and baked goods sold by order at the workshop. In November, 1972, the Adjustment Training Center, Inc. relocated to 612 10th Avenue Southeast. The new facility offered more area for job skill training, more classroom space and more sophisticated equipment for the services rendered by the Center. During the early to mid 1970’s, approximately 40 people were enrolled in the Center. By 1978, our enrollment had grown to about 65 individuals. Harmony Homes, Inc. was established in 1970 and began with one house located on North 2nd Avenue. In 1979, Harmony Homes, Inc. merged to become part of the Adjustment Training Center, Inc. ATC owned four homes and one supervised apartment building. ATC also provided supports to people in their own homes as needed. On February 26, 1992, the Adjustment Training Center, Inc. relocated to our current location, 607 N. 4th Street. The new building provided approximately 40,000 square feet of space which more than doubled the space at our former building. 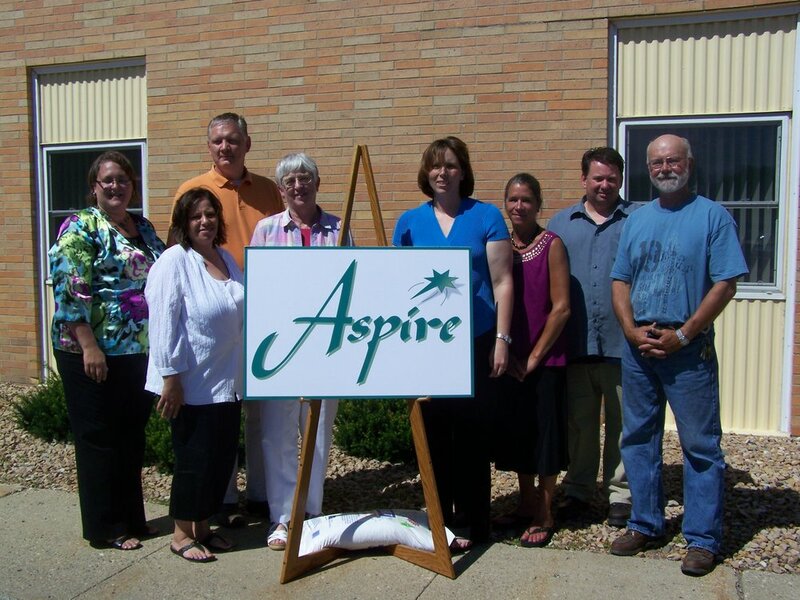 2010 marked the 50th anniversary for the Adjustment Training Center, at which time the agency was renamed Aspire, Inc.
Today Aspire serves around 160 people. Approximately half of the people we support live in their own homes in the community. For those who require more support Aspire offers residential supports in supervised appartment settings or group residences. Today Aspire supports people who work at local businesses. We provide training opportunities for people to obtain work experience. For people who do not have employment goals, Aspire provides opportunities for people to be involved in the community in whatever way is meaningful to them.